Explanation: This sharp telescopic snapshot caught late September's Harvest Moon completely immersed in Earth's dark umbral shadow, at the beginning of a total lunar eclipse. It was the final eclipse in a tetrad, a string of four consecutive total lunar eclipses. 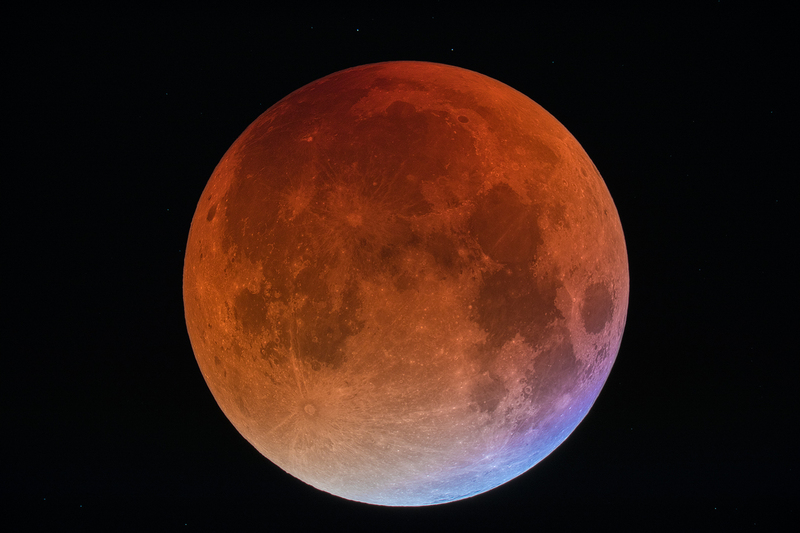 A dark apparition of the Full Moon near perigee, this total eclipse's colour was a deep blood red, the lunar surface reflecting light within Earth's shadow filtered through the lower atmosphere. Seen from a lunar perspective, the reddened light comes from all the sunsets and sunrises around the edges of a silhouetted Earth. But close to the shadow's edge, the limb of the eclipsed Moon shows a distinct blue hue. The blue eclipsed moonlight is still filtered through Earth's atmosphere though, originating as rays of sunlight pass through layers high in the upper stratosphere, coloured by ozone that scatters red light and transmits blue.